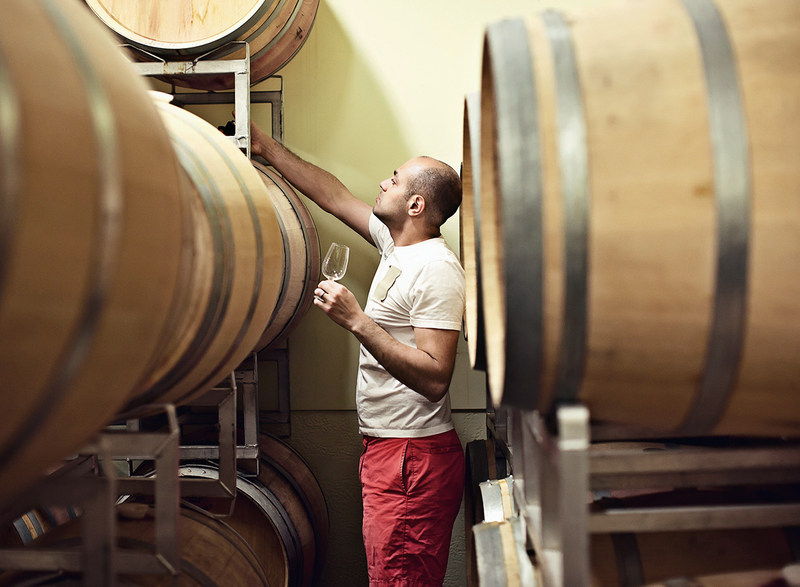 Rasoul Salehi, general manager of Le Vieux Pin and La Stella wineries. It began, appropriately enough, over an impassioned discussion during a restaurant meal in which several great wines were poured. “Wouldn’t it be great,” someone mused out loud, “if we could make our own wines, right at home, and have them with beautiful dinners like this one?” More than a decade later, proprietor Sean Salem’s dream has become a reality—and never one to think on a small scale, Salem and his wife and partner, Saeedeh, built not one but two wineries. Those wineries are the French-inspired Le Vieux Pin, named after an elderly but sturdy pine tree that stands on the winery property to this day, and La Stella, named for the night sky and inspired by Italy. Both wineries are part of a larger family called Enotecca Winery and Resorts, and both are what general manager Rasoul Salehi calls “Old-World style, made in the New World.” The early days, when the winemakers and vineyard teams were still finding their way (Le Vieux Pin’s first vintage was in 2005, La Stella’s in 2006), had some intriguing and often entrancing experiments with pinot noir, among other things, but after a few years, and a new winemaker, Severine Pinte, they are finding what looks to be the right path. Things have really evolved nicely. Pinte was born in France, and she studied wine both there and for a brief time in British Columbia before joining with André Lurton as assistant winemaker in the Languedoc region of France. A few years later, after wanderlust and an abiding curiosity about wine that led her to Australia, she returned to British Columbia and in 2010 joined Enotecca. Le Vieux Pin and La Stella wineries are mostly estate-grown grapes, and all is fastidiously cared for as the wineries search for the ideal marriage of soil, climate, and grape variety. Le Vieux Pin boasts some elegant chardonnay and an astonishingly rich, vibrant Rhône-blend white called Ava. The reds include some lovely single-vineyard, Rhône-style wines—a petit rouge, the annual bestselling syrah, a blend called Retouche, and two Equinoxe wines (one syrah, the other merlot), and as Salehi says, “We are only just beginning to see what these special vineyards can do. Our job is really to handle the fruit that is given to us with care, and make the best wines possible.” Time and trial have provided plenty of information about exposures, soil types, slopes, moisture, and temperature. Add to that a barrel program worthy of any top-tier one and you have wines built to last years, perhaps decades in some cases, and virtually all of them are approachable fairly early as well. That seems to be the way in the New World’s best wineries. La Stella features wines that tend to go along extremely well with food, and all the wines in the portfolio reflect a certain lifestyle choice: good company, good food, good wine, all belonging together. There is a charming unoaked chardonnay, a rosato (rosé) called La Stellina, a pinot grigio, and a stellar moscato, complete with the characteristic low alcohol of eight per cent. As for the reds: one is a kind of field blend, called Fortissimo, of merlot, cabernet franc, cabernet sauvignon, and a touch of sangiovese. There are two big merlots as well; one is called Allegretto, actually not grafted but planted on its own rootstock. The other, Maestoso, is a brooding giant, full of latent fruit when young but with the structure and acidity to make this a very special wine. Le Vieux Pin and La Stella wineries are mostly estate-grown grapes, and all is fastidiously cared for as the wineries search for the ideal marriage of soil, climate, and grape variety. The Okanagan Valley boasts an almost bewildering array of microclimates. One of those things is that there is a desert subclimate near Osoyoos and the United States border. It is the northern tip of the Sonora Desert. This means, basically, good heat units, cool nights, and low moisture; in many ways it is an ideal grape-growing region. 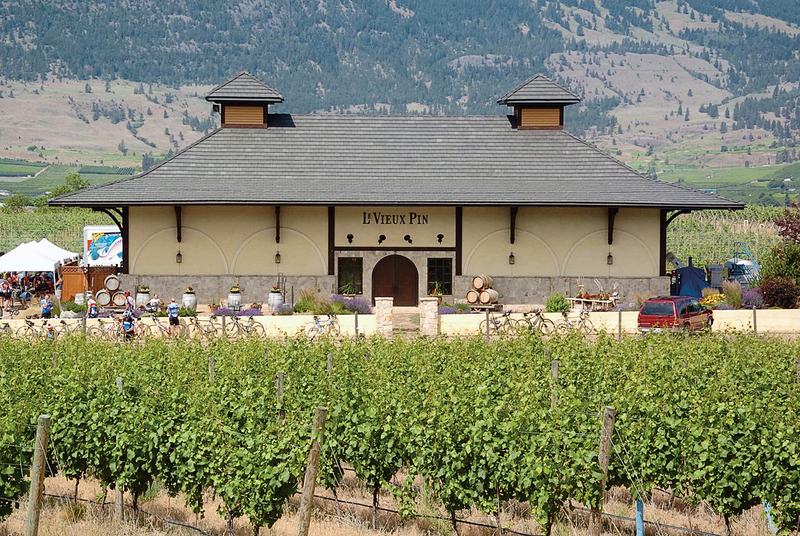 The estate holdings of Le Vieux Pin and La Stella are scattered throughout the South Okanagan, specifically along Oliver’s Golden Mile, the Black Sage Bench, the Osoyoos Lake District, and South Osoyoos. From the very beginning, yields have been kept deliberately low, often below two tons per acre. Concentration and complexity are therefore hallmarks of the wines, most obviously and lushly in the big reds, but even the rosé and the fruity whites show lovely fruit arrays, sustained by bracing acidity. Recently, La Stella held a winemaker dinner at a Los Angeles restaurant called Drago Centro. Centro is located in the heart of L.A.’s business district and run by celebrity chef Celestino Drago. Chef Drago had given Salem his first job when he came to North America, and they formed a bond that has lasted to this day. La Stella was poured with some of the chef’s signature dishes, including a memorable agnolotti funghi e tartufo (tartufo and mushroom agnolotti) with the ’09 and ’10 Fortissimo, petto di piccione arrosto (roasted pigeon) with the ’08 Allegretto, and a carrè d’agnello, gnocchi e zucca, (rack of lamb, gnocchi and zucchini) with the ’07 Maestoso. When chef Drago addressed the assembled guests late in the evening, he simply said, “It is always a pleasure to cook when I know my food will be served with great wines. And I have had a fondness for the Maestoso since the first time I tasted it.” It was a memorable evening, made more so by the fact that virtually no one in the room had tasted wines from Canada, let alone these particular Okanagan wines. For his part, Salem professes that with chefs like Drago, it is easy to be inspired. After the seventh small course— all light, delicate plates of angel hair and stuffed tortellini, some vitello (veal) here and oxtail there, maybe a bit of shaved truffle—it was impossible to argue with them. And why would you?